Last Saturday (29 June), over 100 people with a learning disability came from across the UK to compete in Mencap’s fifteenth Open Athletics Championships at Woodside Stadium in Watford. It was the fourth year that Watford hosted the Championships and, much like the sunny weather, the achievements of the athletes did not disappoint as Declan Manning from City of Norwich Athletics Club (CONAC) set a new English record for the Men’s Senior Discuss, recording a distance of 31.83m, and Chloe Knight also set a new record in the triple jump. The event was organised by Kathy Collins and Di Freeman, who are both long-serving volunteers for learning disability charity Mencap. The pair had further support on the day from 78 volunteers from both Mencap and the Watford Harriers Athletics Club who helped out with everything from making sandwiches to officiating Track and Field events. “People with a learning disability should have the same opportunities to take part in elite sport, enjoy it, and excel in it as all other athletes. That’s why the Open Athletics Championships are always a highlight on Mencap’s sporting calendar. 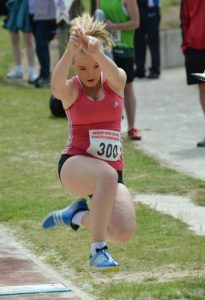 In addition to the Open Learning Disability National Athletics Championships, the day also hosted the Festival of Athletics, which enabled people with a learning disability of all athletic abilities to take part in sporting competition. Be the first to comment on "Learning disabled athletes set new national records at National Athletics Championships in Watford"